Every year about this time, stores of all sorts sell something called “Christmas Cactus”, a showy plant with segmented foliage that arches out over the sides of the pot. Since most people find the foliage relatively unimpressive, the seasonal specials are always sold in bud or with newly-opened blooms. The long, tubular flowers, which appear at the ends of the stems, are made up of many slender, pointed petals fused at the bases. Flower colors range from white through shades of peach, orange, purple, rose and red, with bi-colored varieties widely available. Sometimes merchants trying for early sales offer the similar-looking “Thanksgiving Cactus” starting just after Halloween. To the casual buyer, these are dead ringers for Christmas Cactus and also bear a close resemblance to the “Easter Cactus” sold in the spring. To make matters just a little more complicated, the various holiday cacti are all sometimes sold under the exotic-sounding name “Zygocactus”. So what is up with all of these holiday cacti? Is it all marketing or are they different plants? 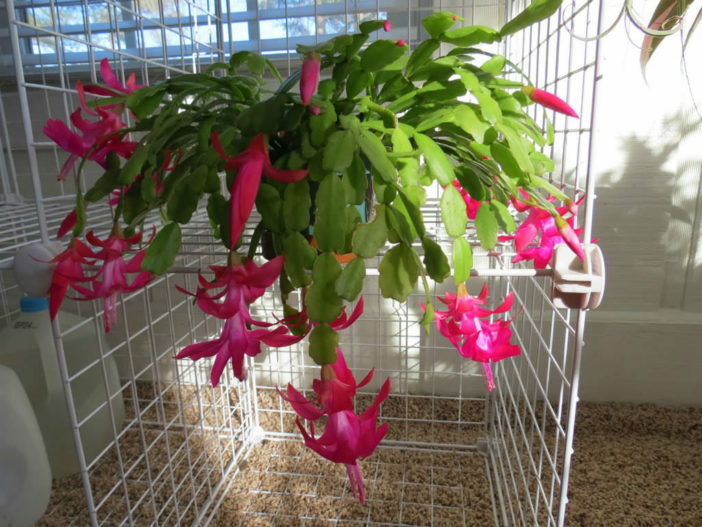 More to the point, if you are seduced by those showy blossoms, will your Thanksgiving/Christmas/Easter cactus survive for more than a few weeks? Southerners, especially older ones, will sometimes tell tales of family Christmas Cacti that have survived for generations. Are they talking about the same plants that now grace thousands of big box stores? Even reference sources differ on the specifics of holiday cactus nomenclature. The experts at Clemson University identify Thanksgiving Cactus as a single species, Schlumbergera truncata, Christmas Cactus as Schlumbergera bridgesii and the closely related Easter Cactus as Hatiora gaertneri. English botanist Martyn Rix identifies Christmas Cactus as a hybrid, Schlumbergera x buckleyi, originally created in the 1840’s by a man named Buckley who crossed Schlumbergera truncata with Schlumbergera russelliana to create the progenitors of the modern hybrid Christmas cactus. What does all this mean? For the average person—absolutely nothing. Those who have nurtured ancestral Christmas Cacti for decades can rest assured that their holiday plants are essentially the same as the specimens that today’s urban sophisticates buy in funky shops to decorate their minimalist apartments. All holiday cacti are very similar, except for bloom times. They are native to areas of Brazil near Rio de Janeiro, where they live as epiphytes, non-parasitic plants that flourish in trees, deriving sustenance from air, water and debris that collect around them. This is good news for those of us who love them, as they don’t need the bright sunlight required by terrestrial cacti. They also do not have the sharp spines of some of their relatives in the true cactus or Cactaceae family. The vast majority of holiday cacti are sold growing in soil-like potting mix. What they really need is excellent drainage, not to mention caretakers who refrain from flooding them with water every day. Overwatering—which means watering before the soil is dry to the touch—can result in potentially fatal rot. If your holiday cactus is not thriving, cut back on water and repot it in a mixture of about 40 percent perlite—available at garden centers—and 60 percent fresh potting mix. Those who hate repotting plants can take comfort in the knowledge that holiday cacti bloom best when they are slightly pot-bound and only need repotting every three or four years. All holiday cacti should come in before nighttime temperatures begin falling below 50 degrees Fahrenheit (10 degrees Celsius). Sometimes, if the plant undergoes dramatic temperature changes, flower buds will drop off. There is not much to be done, other than avoiding extremes the next time. Fertilize with a balanced, water-soluble houseplant fertilizer diluted to half strength. Stop fertilizing in late summer to encourage flower formation in Christmas and Thanksgiving cacti. Resume about a month after the flowers have bloomed.